Barack Obama, the reformiest President in US history, paid what he evidently considers to be valuable lip service to reducing testing in a Facebook message. 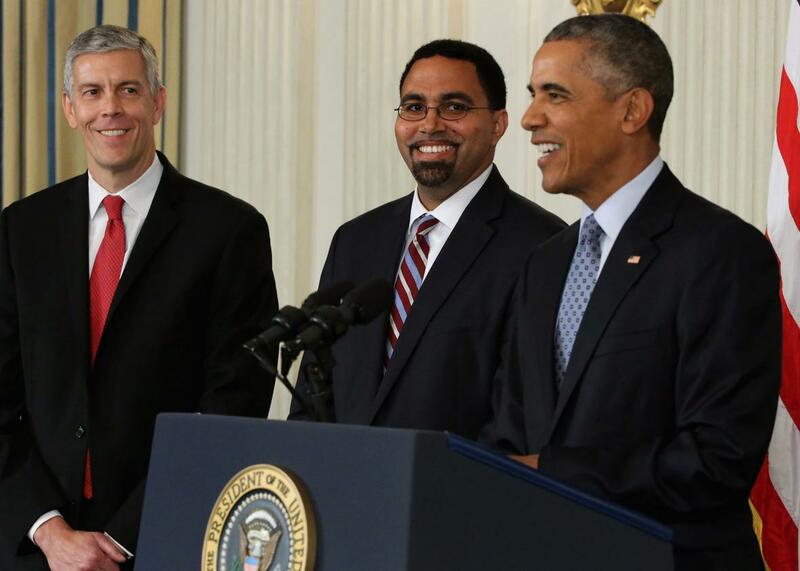 Obama made a non-binding suggestion that districts may or may not accept. Evidently the President stuck his finger in the air, felt the winds of discontent, and determined he did not wish people to blame him too much for the misery his policies have wrought. Today President Obama plans to stand with his two corporate stooges, Arne Duncan and John King, and pretend that he is taking action on this issue. Arne Duncan famously stated that Hurricane Katrina was the best thing to happen to education in New Orleans, and for that drew not a single word of reproach from the Commander in Chief, who appointed Duncan and threw Linda Darling-Hammon under the bus at the behest of huge campaign contributor, so-called Democrats for Education Reform, an astroturf group formed by Mc Donalds and Walmart-loving hedge-funder Whitney Tilson. Pedantic, thin-skinned John King is the guy who canceled NY Common Core forums when he found NY State parents and teachers had the temerity to disagree with him. He called us "special interests." President Barack Obama saw fit to promote him. "It's a big deal that the president and the secretaries of education-both current and future-are saying that they get it and are pledging to address the fixation on testing in tangible ways," Weingarten said. But, she added, "the devil is in the details." To my memory, this is at least the third time I've heard Weingarten praise the President for words. But words are not deeds, and in the deeds department Obama is sorely lacking. Obama enabled and supported Race to the Top, which waved money before the noses of cash-strapped states and pretty much forced them to accept Common Core and junk science-based teacher evaluations. Even then, after pretty much making teacher jobs dependent upon test scores, Obama was saying things like we shouldn't teach to the test. Does he think we should set ourselves up for dismissal based on the junk science his programs have enabled and mandated? Who knows? That's just one of many factors he hasn't bothered to consider. I voted for Obama the first time he ran, though I had deep reservations about his obvious ties to reformy astroturf groups with suitcases of cash to offer candidates they could buy. It quickly became clear that Obama not only gave GW Bush a third term in education, but was also willing to sign off on pretty much any program self-appointed education expert Bill Gates was able to pull out of his abundant hind quarters. The second time Obama ran, Randi Weingarten's AFT endorsed him, asking no concessions whatsoever, but I was unable to vote for him. The explosion in testing Obama now bemoans is a direct result of his policies. It's not enough to talk about non-binding policies now that he's a lame duck. On education, Barack Obama's legacy is the very worst of any President since the inception of public education. He's moved us backward and extracted the joy of learning with almost surgical precision. And despite his words, demagogues like Andrew Cuomo and Chris Christie are not going to move toward reasonable policies anytime soon. Though they're also willing to drop a few words here and there, they don't want to make any reasonable changes and read about themselves in the NY Post. It's pathetic that, in the United States in 2015, the President, not even facing election, is too timid to appoint a Secretary of Education who isn't insane. Even worse, the best he can do for us is advise us we don't have to kill our kids with testing. The fact is neither Obama's kids, nor Duncan's kids, nor King's kids are subject to the hurtful policies they've imposed on our kids. And that is nothing less than a national disgrace. Related: Principal Tim Farley points out we already have a 2% cap on test time in Andrew Cuomo's NY, and that it's not nearly good enough.